Chicken fillets are always a handy thing to have. They’re very quick to cook, adaptable to a variety of recipes and is relatively healthy. One quick way I like is simply dusting with creole seasoning , then giving it a quick pangrill in butter. Cooking chicken this way is very flavorful so I like pairing it with fluffy, creamy mashed potatoes. Whenever I’m too lazy to make mashed potatoes from scratch, I use ready to mix powdered kinds. I don’t stop with the package instructions though, I usually add in more butter and milk then season with salt and pepper. I can actually delude myself that it’s homemade that way. To round it out, I steamed some frozen vegetables quickly. Green peas and corn & carrots to the rescue. Finally, I included a yummy pudding-filled marshmallow, sent to me all the way from a friend in Canada and my favorite Green tea-filled marshmallow. The pudding mallow isn’t really filled with pudding but a gooey, softer marshmallow that’s pudding flavored. Even if it’s not the real thing, it’s still quite yummy. I really need to get cracking on making bento for myself. Aside from saving money, it’s fun! 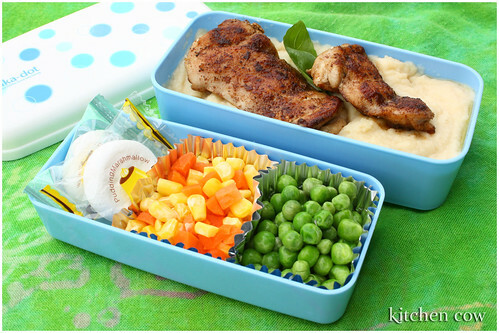 Your bentos are always so cute… you enven made mashed potatoes less boring! Genius. Sometimes I like eating corn just like that. Hi Zee! Thanks for the kind words. Went to your blog and saw that you’re from Manila too. By any chance do you know where pudding marshmallows can be bought here? So far, all I’ve seen are the green tea (my favorite hands down), jam, milk and chocolate mallows.